We’re still a couple of months away from Central Scouting’s annual midseason rankings, but the NHL’s amateur talent evaluation staff released the watch list they put out every year as the new season gets underway. In this particular iteration, the CSS does not rank the players, but organizes the players by league/competition level and assigns each an A, B or C grade. Players with ‘A’ grades are expected first-round selections next June. ‘B’ players are expected draft selections and the ‘C’ players are on the bubble but have a shot- hence the use of the “players to watch” to describe the list. But enough with the administrativa…here are some thoughts on a few of the players on the list I have some knowledge about through live and online viewing, not to mention discussions with NHL scouting sources. This is by no means a comprehensive list- my position with Red Line Report limits my ability to go into exhaustive detail, but my hope is to give the readership a good starting point for further research. Vitaly Abramov, LW Gatineau (QMJHL) 5-9, 172 (B)- Little but electrifying winger brings pure speed and dynamic puckhandling and creativity to the table. Impressive start and he’ll likely rise as the year goes on because of his upside. Kieffer Bellows, LW U.S. NTDP (USHL) 6-0, 196 (A)- Son of former NHL 50-goal man Brian Bellows is a Boston University recruit and native Minnesotan with a knack for finding the back of the net. He’s a good skater but has the scorer’s instincts, hands and heavy shot to finish off chances. Tyler Benson, LW Vancouver (WHL) 6-0, 200 (A)- Injuries slowed his start as he has yet to get in on the regular season with the Giants, but this edgy scoring winger has the tools and pro attributes to be an early pick and eventual NHL star. He was impressive in helping Canada to yet another gold medal at the August Ivan Hlinka tourney in Europe. Jakob Chychrun, D Sarnia (OHL) 6-2, 215 (A)- Wonderful talent/skill with the head and maturity to be an instant impact defender and eventual franchise cornerstone. His first goal of the season exploded off his stick, shattering the the shaft, but the puck rocketed into the net top shelf. With his ability to skate, move the puck and play a smart game, he’ll be the first defender off the board in June and will challenge Auston Matthews for top billing. Alex DeBrincat, RW Erie (OHL) 5-7, 165 (A)- Late ’97 Michigander lit it up to the tune of 51 goals and 100+ points a year ago riding shotgun with Connor McDavid. He impressed by amping up the production when McDavid was lost for a month with a hand injury, so there is reason to believe the small but fast and highly dangerous scoring wing can do it again. Timmy Gettinger, LW Sault Ste. Marie (OHL) 6-5, 206 (B)- Massive winger isn’t fancy but he just goes to the net and unleashes a cannon shot that can beat goalies cleanly or uses his hand-eye coordination to deflect pucks into the net. Gettinger was one of the few bright spots on Team USA’s Ivan Hlinka entry this past summer. He’s a bit raw at this stage, but you can’t argue with the physical attributes. Olli Juolevi, D London (OHL) 6-3, 180 (A)- High-end Finnish talent from the back end left home for North America and is an impressive package of skating, passing, shot and offensive instincts. He alternately impressed and provided scouts with plenty of areas to address in the first weekend of OHL games, but there is no arguing that he has unlimited potential. He’ll have to work on the little things like his reads, pinches and making the right decisions under pressure, but he’s going to rack up some points for the powerhouse Knights this season. Luke Kunin, C University of Wisconsin (Big Ten) 5-11, 193 (A)- Missouri native who grew up skating with Tkachuk showed off the impressive chemistry the two have together when he blasted a top shelf shot past Evan Sarthou just seconds into the All-American Prospects Game last week. Has the skating and shot of a prolific scorer and the Badgers will welcome him with open arms after a tough season in 2015. Charles McAvoy, D Boston University (HEA) 6-0, 208 (A)- Heady defender can do it all- he pushes the pace with his skating and runs the PP like a seasoned veteran. The Long Island native might not possess ideal size, but his brain and skill level will allow him to make a rapid transition with the Terriers as a freshman. Jesse Puljujarvi, RW Karpat (Finland) 6-4, 205 (A)- Finnish power forward will be a coveted draft commodity for his size, smarts and polish. A guy as big as he is- essentially a linebacker on skates- should not be as quick and nimble while making it look so effortless. He, Matthews and Chychrun in my view are at the head of the 2016 class. 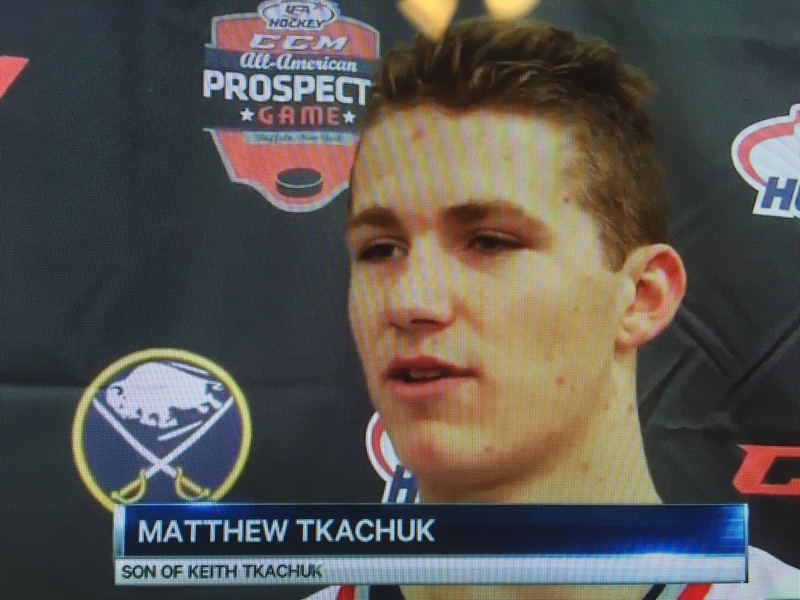 Matthew Tkachuk, LW London (OHL) 6-1, 200 (A)- I must admit, my man-crush on Keith’s oldest son might be a tad disturbing, but this is a kid who can just flat-out get things done. You hate to compare him to his old man, but it’s inevitable, and while he might not have Keith’s pure size and power (yet) he’s every bit as smart, instinctive and driven. Beyond the uncanny physical resemblance to his dad, Tkachuk is a different player, but every bit as coveted in the modern NHL for his ability to provide offense and be effective in the faceoff circle (even though he’s a winger). Tkachuk was a force in the AAPG and racked up 6 points in his first two OHL games as an encore. The scary thing is- had his linemates been a little more on the ball, he might have scored 10+ last weekend. He’s active and engaged around the net and is only going to get better now that Mitch Marner and Christian Dvorak are back with the Knights. Just in time for Halloween- the OHL had best be ready for a horror show.